Frosty the snowman was a jolly happy soul! And he is square number 3 of my Crochet Christmas Character Afghan! If you are just joining in to this impromptu Crochet-along, that is ok! You aren’t far behind. I am creating 9 Christmas themed C2C crochet squares and when they are all finished, I will stitch them together into one large afghan! As I finish each square, I will post the graph and reveal the next character/image in the blanket. Feel free to work along with me! I am using the corner-to-corner (C2C) technique. You can see my first C2C graphgan HERE that has a how-to video. But I am told that most people have success learning how to make a C2C afghan by following THIS VIDEO DEMONSTRATION by The Crochet Crowd. Each pixel graph in my blanket is 25×25 pixel squares. I used a size F (3.75mm) hook and worsted weight yarn. For this particular square I used Lion Brand Vanna’s Choice in Little Boy Blue, White, Black, Terracotta Orange, Scarlett Red, and Fern Green. VERY IMPORTANT: Instead of the traditional C2C method of using DC’s and chain 3’s to make each pixel, I used HDC’s and only chained 2 (and chained 5 instead 6 on the increase stitches). This allowed me to have a smaller overall afghan square, measuring approximately 15×15 inches. You can absolutely use the traditional method but your square will be much larger and your overall afghan will be much larger as well once you sew them all together. As is, my finished blanket will be big enough for a twin size bed… possibly even larger! You do not have to use the C2C method either! You can take this graph and make a standard SC graphgan. This will produce nice small squares (think 25 single crochets wide and tall) that will be perfect for a standard size blanket. You could also make Pixel Granny Squares and use the graphs I post to create separate character blankets. There is also the Bobble Stitch method as well! So many ways to use these graphs! I hope you are enjoying this series of pixel squares! Stay tuned for #4 coming soon! Written pattern for the color changes by fellow crocheter and RCM follower, Claudia Melgar! Need help with your C2C squares? Join my Repeat Crafter Me Crochet Facebook Group! Hundreds of fellow crocheters are also working on this project, asking good questions and getting great answers! Merry Christmas Crafters, Crocheters, and Yarn Lovers! Any chance for that awesome girl that wrote out the graph/ color changes etc for the Santa is gonna do the same for the rest? It helped me immensely as im just learning to follow graphs!! How do you change your colors? I would love a video on how you change your colors in the C2C. It seems to stump me. These are awesome, I am still trying to get up enough nerve to make C2C afghans for each of my grandsons . I have found pixels designs but need to adjust them so they work out rectangular. Guess time to get some graph paper and get my brain working…lol. Do you leave you balls joined and carry colours across when you change colours , or do you cut and rejoin as needed? Oh my goodness these are sooooo adorable!! I am going to start making my own right away! Thank you for posting the graphs. Where did you find the Little Boy Blue yarn? I am half way finished with the Santa and loving it! I ended up having to buy more on Amazon because I couldn’t find it in stores anymore (originally I got it from Michaels)! Honestly, if you have a similar color I would use that. I have a sneaking suspicion it might be getting discontinued! I can’t find Little Boy Blue anywhere either. Will it be needed in other squares? I’m going to try to order from Amazon. Almost finished with the Christmas Tree. These are all so cute! Sarah, I just love these squares. You have helped bring back my crotcheting “mojo” with this project. Thank you so very much ! Can you tell me if you have the written pattern instructions for the snowman square as you did with the previous two squares. Thanks for inspiring me to work on this. My Santa is going fine! I am not sure how to hide the lose ending lines (las lanas que sueltas). I hope to show you my work soon!! I went to stock up on the Vanna’s Choice yarn (love it!) but I was wondering if one skein of each color is what you used? I did notice that for square 2 you noted to get two of each of the greens used. Thanks! Finshing square #1 . My first C2C project. So happy!! Thank you. I am loving these. I have never done a graphgan before and feel I have learned so much already. Is there a complete list of the yarn colors for all nine squares? I couldn’t find the little boy blue either, so I substituted loops and threads, Impeccable yarn in clear blue at Michael’s. I love these squares! I have made the first two in c2c and am now working on them in bobble. It’s very difficult for me to count the squares and am using the c2c completed pieces to use as a graph for the bobbles. For the c2c, I’ve been using the written version. Is there going to me a written version for the snowman? Thank you. My 10 year old daughter & I are doing the squares with you. & love them! I have the same question about how to properly do the color changes though? I carried some, but they show. Advice would be appreciated. Would love the written instructions for the snow man please! Will you be posting the written pattern for the snowman soon? Hi Sarah! I love your site and all your beautiful creations. Do you happen to have the snowman translated? It would be a big help. I am trying to keep up with you but with a full time job I dont have as much time as I would like to crochet. Take care and continue Crocheting! 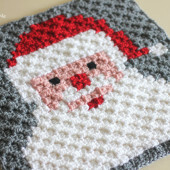 Do you know what the 3rd square in the Crochet Christmas Character Afghan will be? I’m trying to carry my yarn and not cut it, but I’m having a big problem with tangles when I turn my work….anyone else having this problem? Am I doing something wrong? The written directions for the snowman changed the colors that were used on the graph. would like to know if the rest of the squares will be posted soon. iv noticed with square3 snowman one that the graph finished picture and the writen pattern are all slightly different. in the finished square the snowmans backround is blue and hat has green trim in the written insturctions the backround is charted as grey and the scarf colours inverted as well as hat band being green. 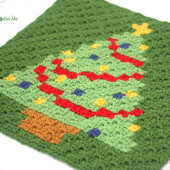 I just finished the santa square and noticed a lot of these comments are very old…I would love to make this whole blanket, but there are only pixel graphs for the first 3….is there another place I need to be looking for the rest of them? I can see the first 3 blocks, but not the other 6? How can I do this? How do I make sure I get all of your squares?